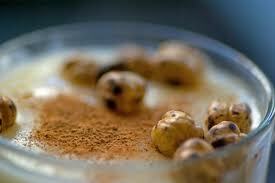 Boza and salep are traditional drinks with specific, familiar flavors. 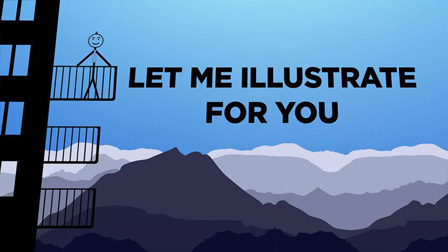 They do not require expensive advertisements and advertising agencies. Their customers are regular, and can’t wait for wintertime to come, especially in the Balkan countries. Fans of traditional flavors eagerly wait for the winter to be able to enjoy the tastes of seasonal drinks such as boza and salep. Although they are slowly giving way to new, popular drinks, Balkan nostalgia for traditional products continues. In Istanbul it is “Vefa”, in Ankara “Akman”, in Skopje “Apce”and “Seherezada”, in Athens, in Paleo Faliro quart you’ll find the places where you are free to come round and enjoy the irresistible and nutritious taste of boza and salep. Balkon3 offers you a closer look into these old drinks, old flavors that recall ancient times. 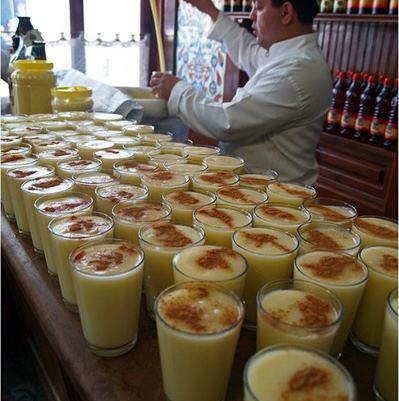 Boza is believed to date back several thousand years ago. According to some research, it was transferred from Central Asia to Anadolia and its surroundings, with the help of nomads. Its current name comes from the Persian word ‘buze’, which means a drink made from rice and millet. 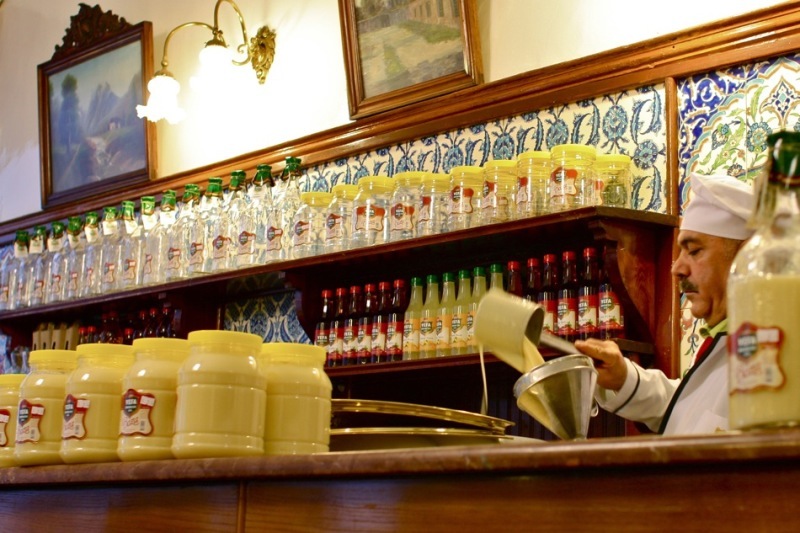 In Turkey, the tradition of making boza started long ago, to be more precise in 1876, in the specialised stores “Vefa”, opened by Haji Sadiq. In a short while it became a recognizable brand across Turkey. 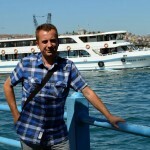 It is located in the municipality of Eminonu, Vefa district. If you talk to older Istanbul residents they have stories to tell you about boza street vendors moving up and down the alleys of the metreopolis. Boza went up and down the streets until 15-20 years ago, in the cold nights, singing a variety of songs, chanting “boza” “bozaaa”. Gradually, with the replacement of old wooden houses with tall buildings, a growing clamor in the streets was caused by the products of modern technology, so people could no longer hear the call of boza sellers. And that is how they disappeared. Famous “Akman” brand, is typical for Macedonia. The owners are immigrants of Albanian origin, Muharrem and Vahap, the Akman brothers. The first boza store opened back in 1936. In Macedonia, a good glass of boza has been connected with the cake shop “Apce” in Debar Maalo, Skopje, near the Universal Music Hall. It was opened in 1934 by Isman Kadri. Because of the good boza people often used to say that it is the cure for all diseases. In 1940 he renamed the cake shop “Apce” (a pill), and it is still called so. 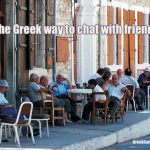 You may be surprised, but in Greece boza is not actually very popular. In Athens it can only be found in specialized bars, and traditionally in Paleo Faliro quart, which is actually a suburb south of Athens. 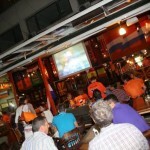 There lives a big community which moved from Istanbul in the 1960s onwards. 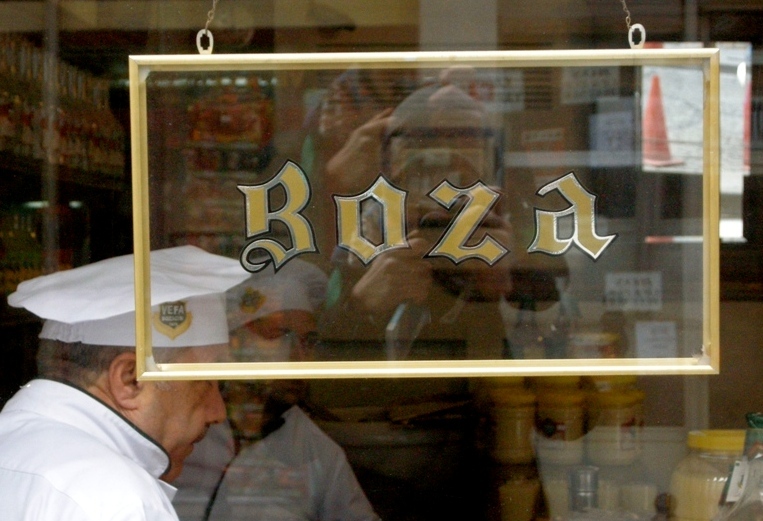 There are specialised boza shops and restaurants. It should be noted that boza is not advertised enough, so if you want to find a drink you will have to look for it and ask for it, but at least the locals here know and enjoy drinking boza. 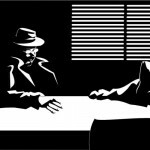 It is the same situation in northern Greece with one exception. Thessaloniki has a specialized confectionery named “Hatzis”, founded in 1908, when its owner came from Kosovo and started to producee boza in Thessaloniki. Now the family of Hatzis has opened several restaurants in Athens, but the prices are too high. Nevertheless, boza is not advertised, and no attempts are being made to popularize it, though it can be found in local restaurants. Salep, on the other hand, succumbed to the attacks of the tea-coffee duo. Nowadays, in Skopje, you can try it only in the oldest sweets shops and tea houses in the Old Bazaar. Salep began to be used as a drink in the 17th century, until then it was used as medicine with various spices and pink water added to it. In the 18th and 19th centuries it was sweetened with jam, honey or sugar, with ginger or cinnamon on top. In medieval Europe during the long oversea journeys, salep was often found stored in ships’ warehouses, because of its nutritious values. 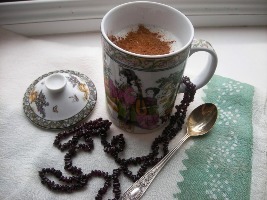 The first salep shop in England was opened in the first half of the 18th century. Believe it or not, in the middle of the 18th century, especially in England and France, salep was consumed in shops and restaurants in the morning. 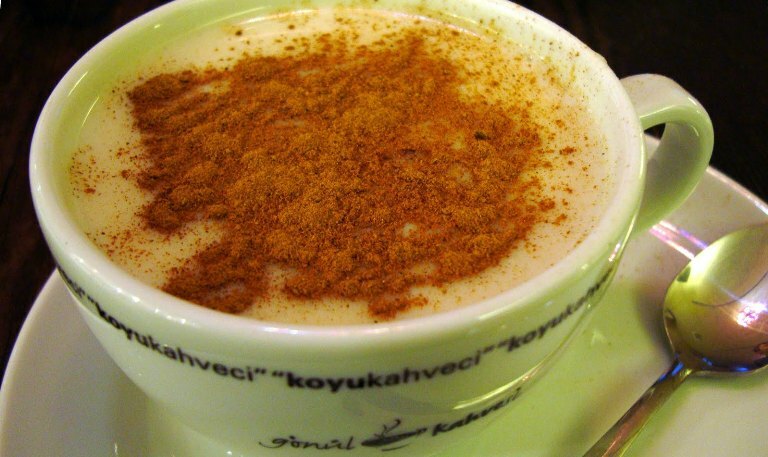 Drinking salep is considered one of the oldest customs in Athens. It is a winter drink that softens the throat and keeps you warm. It can be found in the city center in street vendors, on the squares, in grocery stores and it is usually consumed early in the morning. 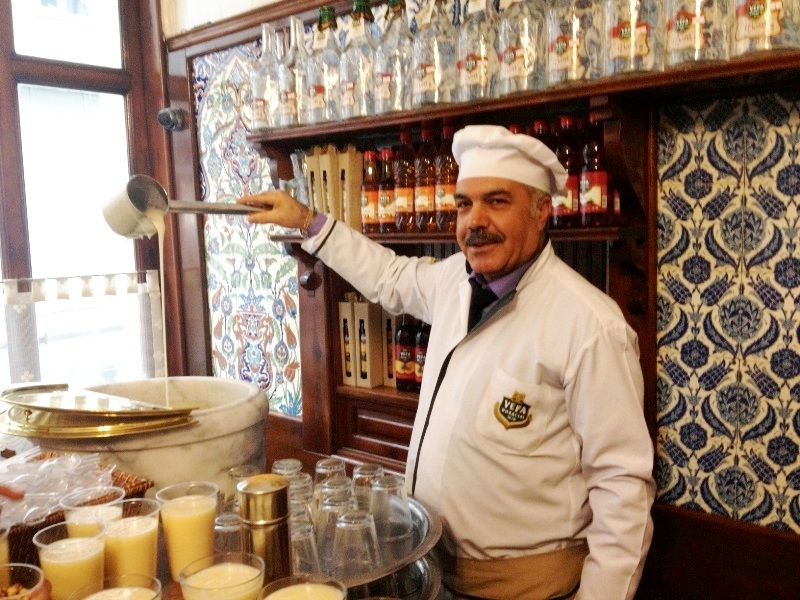 Some traditional, old fashioned bars sell salep in the street and the Hatzis family have recently started selling it as a takeaway drink. Bulgur is left in water over night. The next day, boil bulgur and rice until well softened. Mix it with electric mixer, then you need to sift it through a sieve. Boil the mixture at low heat, add the sugar and stir until it melts. Then remove it from the fire and allow it to cool, stirring it from time to time. After it is cooled add the old boza or yeast which you have previously melted in hot water. Mix it well, put the mixture in a well closed container for 2-3 days at a temperature of 20-25˚C, whit occasional mixing. Once bubbles start to appear it is considered that the mixture is ready. Cool it and serve it with chickpeas or cinnamon on top. Pour salep and sugar into a pot, mix them well, add milk and boil at low heat for about 10 – 15 minutes until it gets dense. Pour it in cups or glasses and sprinkle with cinnamon. It is the most important sign that we have passed from autumn into winter.